“Spy” is a James Bond genre action film with all the frenetic combat, special gadgets and exotic European locations you have come to expect from these offerings. 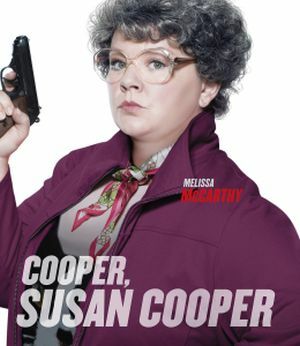 The two huge exceptions are that our undercover superagent is plus size woman Susan Cooper, played by Melissa McCarthy, and the film is a hilarious comedy! McCarthy has been referred to as the funniest woman in the world and she certainly doesn’t disappoint here. The basic setup is that Cooper is a highly trained CIA field agent who, because of her size and being a woman, has a career limited to sitting at a desk and feeding information to the strikingly handsome male superhero Bradley Fine (Jude Law) we would expect in such a film. When the situation offers an opportunity, events take a dramatic turn with our heroine being released upon the world to perform her nonstop hilarity and over-the-top physical feats as she vigorously confronts the minions of evil. “Spy” includes a bit of the real-life poignancy of a person held back by society’s preconceptions. These moments of vulnerability are handled deftly by McCarthy and before things can get preachy the hilarious action wraps it all in great fun. McCarthy has always been crashing through the stereotypes most would have for her, by refusing to assume these should have anything to do with her choices. She’s become quite a role model whether or not she intended to. She certainly can be taken seriously as a comedienne. I wouldn’t be surprised if she could handle some really serious drama. Way to go, Melissa! It has been reported that the area of greatest increase in plastic surgery requests for the year 2014 was for derrière enhancements. This doesn’t seem terribly surprising given the amount of media attention directed at certain music, acting and reality show stars who have so much attention directed at their bottoms. Most of what I read about body enhancements through plastic surgery leaves me with concern that people are so frequently needlessly paying good money and taking health risks to achieve goals that usually strike me as rather minor, even unnecessary, and too often completely counterproductive. One positive note this latest news strikes in me is this increased democratization in our culture’s definition of beauty and female allure. Much has been said in the past about the unfairness of requiring women to be slender in order to be pleased with how they look. Much ink has been expended bemoaning the unfairness of making it difficult for teenage girls to be comfortable in their bodies unless they are among the minority whose genetics gift them with the tall slender appearance so long the ideal for American female beauty. This theme invariably includes strong concerns we have for the negative physical and emotional impacts of eating disorders, obesity and body dysmorphia. Ideally our standards of physical beauty for men and for women would be broad enough so that people from a wide variety of body types could be pleased with the physical self they have to work with. After all, individually we had nothing to do with what mother nature gifted us with physically. Happiness in this area seems to come from accepting comfortably the reality of who you are physically and embracing a lifestyle that nurtures and protects the healthiest and most physically competent body you choose to live in. Let’s hear it for the broadening of our definition of female beauty!